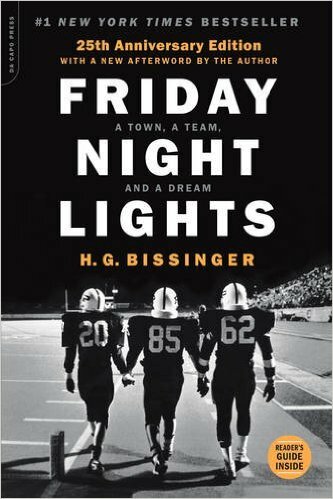 This is the story of the Permian football team in Odessa Texas. They are the winning-est high school football team in Texas history. The book follows the year long journey of the 1988 football team. The author moved to Odessa with his family so that he could be engrossed in the local culture and really get to know the team, coaches, and the town. Odessa is a depressed, recently desegregated town in West Texas. Known for being one of the worst cities to live in of all America, the town cares for little else besides football. Drawing crowds up 15-20 thousand people for a Friday Night game, you were a local hero and star if you ever played on the Permian High School Team. This team knows that their only goal is to win at all costs, and find that sometimes that cost it too high. I really enjoyed this book. I shook my head several times at the stories I read about how much stress these kids were under to perform high school football. How education took not only a backseat, but basically wasn't even on the radar as long as their best players didn't have to sit out due to grades. One school took it all the way to the judges in the court to make sure that an Algebra grade could be over looked so that the kid could play on his football team. There were a few kids on the team who were as naturally bright as they were talented - one even went to Harvard. But while they were in high school, football was king, and no matter where you were in class rank, it didn't matter if you couldn't perform on the field on Friday night. I encourage you to check this book out. I am going to watch the movie and TV show next to see how it compares.